The settings dialog contains several tabs with specific settings under each one. This page describes the General settings tab. Note there is a scroll bar on the right side of the tab. You will need to scroll down to see all options on this tab. This is the font used to display the text on the garage screens you see when not in the car. The drop down displays all fonts available on your system. Select the desired font from the list. These colors are used to display the text on the various garage screens you see when not in the car. Change these colors to change the look of the garage screens. Clicking on any of the swatches will will display a color chooser which allows you to select the desired color. These colors are used to create backgrounds of the various garage screens you see when not in the car. Change these colors to change the look of the garage screens. Clicking on any of the swatches will will display a color chooser which allows you to select the desired color. This determines how speeds will be displayed, either KPH or MPH. This determines how amounts, such as fuel, will be displayed, either liters or gallons. This determines how pressures will be displayed, either kPa/Bar or PSI. This determines how temperatures will be displayed, either celsius or fahrenheit. This determines how distances will be displayed, either meters or feet. This turns Kiosk mode on or off. Kiosk mode will cycle through all selected dashboards for the car, overlaying the name of the dashboard. This is intended for trade show and similar events. This is the font size that will be used when displaying the time on all dashboards and garage screens. If you have a touch screen LCD, then this must be set to Enabled in order for the touch data to be read. This drop down allows you to turn on various debug modes which can help diagnose problems. In most situations this can be left set to off. Note that selecting a debug option can slow down frame rates due to the amount of data output during the debug process. This is the brightness level of the LCD screen. It can be between 1 and 255. Higher numbers are brighter. This is the brightness level of the LEDs in the SMZ1 wheel. It can be between 1 and 255. Higher numbers are brighter. When set to Always the software will data log every lap you run in all sessions. When set to Never the software will not record any of your laps. When set to Button the data logging will be toggled on and off by the user specified button. When set to Yes the standings dashboard will automatically keep the list of drivers scroll so that you are visible on the screen. When set to Yes if you were running the software on a Z1 LCD Screen and that screen became disconnected for any reason and is then reconnected, the software will attempt to reconnect to that Z1 LCD Screen. When set to Yes the software will save your split times after each session. This allows you to compare laps to ones set in previous sessions. If you do not want to save your split times, set this to No. With the No option set every time you get into the car your split times will be based on whatever times you set during that session. When set to Always the software will continually alert you to new versions that are available. When set to Once the software will only alert you to new versions one time. This can be set to Yes or No. When set to Yes the instance will pause for 16 milliseconds each loop. If you have a very high end system you can set this to No in order to gain some extra performance in the software at the expense of more CPU usage. This can be either Yes or No. When set to Yes this instance will run at Windows high priority. When set to No it will run at the Windows default priority. Running at high priority can sometimes give slightly more responsiveness on high end systems. This is the location where the Dashboard will create the ZOD telemetry files. You can click the Browse button to open up a file chooser allowing you to select the desired location. Alternatively you can type the full path directly into the text field. The default location is documents/z1dashboard. This is for iRacing only. 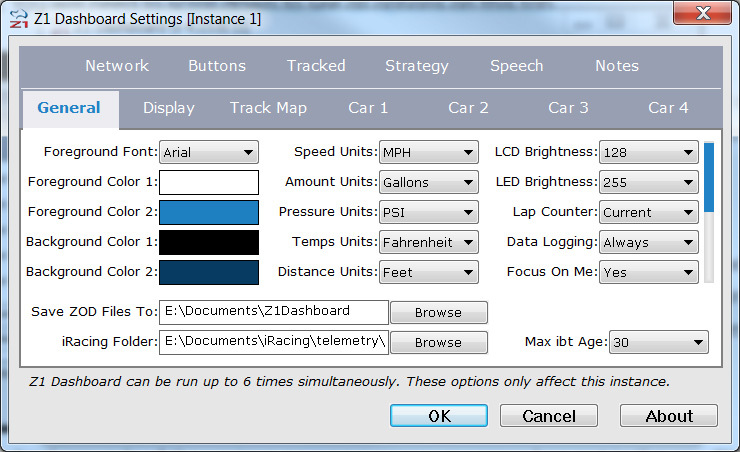 To use the IBT telemetry analysis tool you need to tell the app where your iRacing telemetry folder is located. You can click the Browse button to open up a file chooser allowing you to select the appropriate folder. Alternatively you can type the full path directly into the text field. See this page for details on how to fully setup telemetry analysis. This is for iRacing only. This specifies which IBT files you can select to review using the telemetry analysis tool. Any file older than the specified number of days here will not be displayed as a choice. This is to prevent the number of files from becoming unmanageable.